The problem was this: When I decided to whip up* two of these compact, portable-looking focaccia breads to take along on a road trip as a gift to our hostess, I thought that the grapes I had in the fridge were seedless. …and I most definitely spied a seed. Two, actually! Alas, it seems to have been worth it in the end. 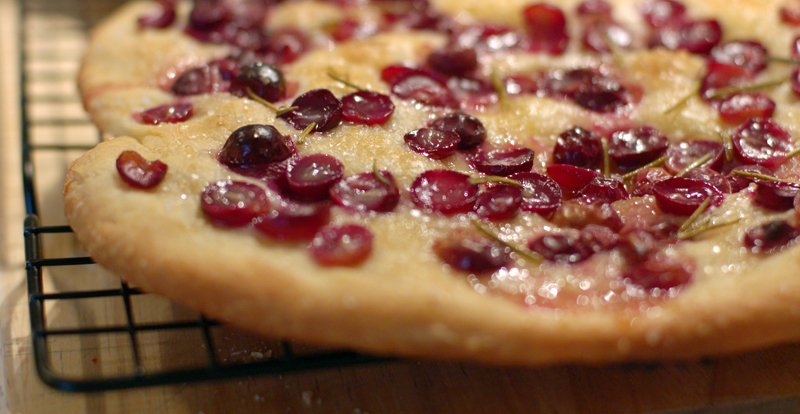 I’ve got two lovely looking focaccia drizzled with oil and sprinkled with salt and sugar and grapes and rosemary. The house smells of Italy. *** Now my only issue is how not to devour them both before tomorrow. *I have never, ever, in my entire kitchen history, been able to just “whip up” anything. Why I thought this would be my lucky day, I cannot explain. **Now, I do know: about 20 minutes to leisurely slice and de-seed 1.5 cups. ***Or at least the Italy of my imagination. Looks awesome, Molly. I know they’ll enjoy it. Looking forward to seeing you tomorrow. I thought you might be interested in the latest from the LA Times’ SOS column. Fruit focaccia is the featured recipe. They, too, sound delish! Oooh, nice. I was also making peach pizzas with goat cheese and a reduced balsamic there for a minute. A peach baked hot for 10 minutes is a luscious thing, if I do say.